Please note we are closed during Easter/Anzac period. Any orders placed will be processed on Monday April 29th. An all day Mechanics gloves thats oil, fuel and battery acid resistant. Textured Grip, double dipped and breathable. 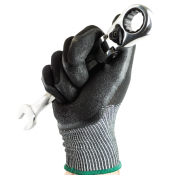 A genuine mechanic’s glove made to impress as an established product in the premium KOMODO® range. **..